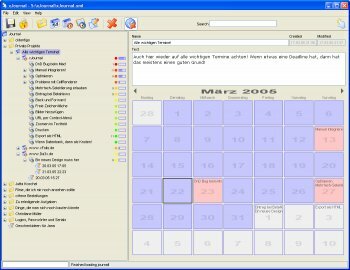 I have tried several organizer programs. This one is ideal for maintaining that "view from 30,000 feet." I start and end each day with a quick look and immediately know where I am on every project. Nice work. Sorry, but my last release (0098) prevented successful testing with some bug on startup. Please grab the new release (0102+) from the website or when this entry has been updated. Thanks! It's really the program I looking for. Thanks for the good work. Looking for more new features and improvement. xJournal is getting better. THX for this Version. Nice little proggy. Exactly what I needed. Could you please clarify your problems with the textbox (send me an email please)? Copy/paste and typing works well for me. You can also use the popup menu for some simple styling. The painting-bug in the tree is temporary and will be fixed in the next release. Any other problems? The Idea is really good, i like the Userinterface.I would use it, but there are to many Bugs. Sorry version 1.2.0069 is full of Bugs, for example GUI repainting and the big right Textbox (i cant type,copy,paste some text without errors). Do you think xml is the right Database Filetype? now xJournal is on my Watchlist, if it gets better I use it.